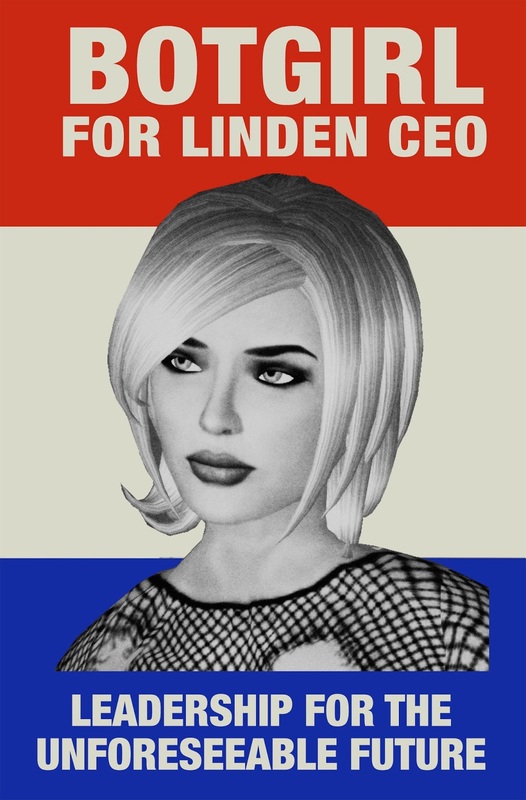 Now that Rod Humble has stepped down to chase his entrepreneurial dreams, I'm throwing my hat in the race to become the next Linden CEO. Yeah, I know it's not an election, but as a fictional character, I'm perfectly entitled to run a fictional campaign. The next few years will determine whether Linden Lab fades into GeoCities obscurity or reinvents itself in the face of an ever-more-mobile and pervasively connected world. Revenues are down. Growth is flat. Fortunately, I have a plan! 1. Look to innovators in the Second Life community for product direction. I'd make sure that the future of Second Life is guided by the needs and concerns of the users. I'd seek counsel from the artists, educators, entertainers, entrepreneurs and community leaders who are doing great things. I'd support them and help them help us. Linden Lab is an Agile shop, so that's what they should have been doing all along. 2. Get the platform in shape for the future. Given the age of the Second Life platform, it's probably held together by the digital equivalent of bubble gum and bailing wire. Despite the failure of competitors such as Blue Mars and Cloud Party, it's only a matter of time before someone like Valve or High Fidelity steps up to the plate and nails a virtual world that's technologically generations ahead. I'd accelerate efforts to modernize the platform to prepare for a lag free, higher resolution and more pervasively connected future. 3. Figure out mobility, sensors, 3D printing and the Internet of Things. I'm still skeptical about mobile devices as a primary platform for virtual worlds. But it's a no brainer that people who are active in virtual worlds would like to be able to jump into their avatars and communities from smartphones and tablets when they're not at a computer. There are also tremendous opportunities around 3D printing, sensors and wearable devices, all of which are about to break into mainstream use. Linden Lab should be on center stage, not waiting in the wings. In the economic expert witness game, they say that any number beats no number (i.e., judges are favorably inclined toward the guy who tries to quantify things if the other guy punts on the effort). Surely any plan beats no plan, right? However, I'll miss your tweets when you're CEO. If Rod was any guide, the CEO doesn't dare interact with customers. Hi, Botgirl! I rather like your platform. I think you've said a lot in those three central areas of focus. If whomever takes the CEO position next actually hears what you're saying (or if you end up in the corner office), things could indeed go well for SL and LL. A girl can dream, and - as anyone who knows me will tell you - I ALWAYS dream, and I believe in the possibilities. SL lit this fire. It's time to stoke it!